I had the opportunity to take a very spur of the moment trip to Honolulu, and given the winter rains in Vancouver there was little doubt that I would go. I mean, who would say no to going to Hawaii? 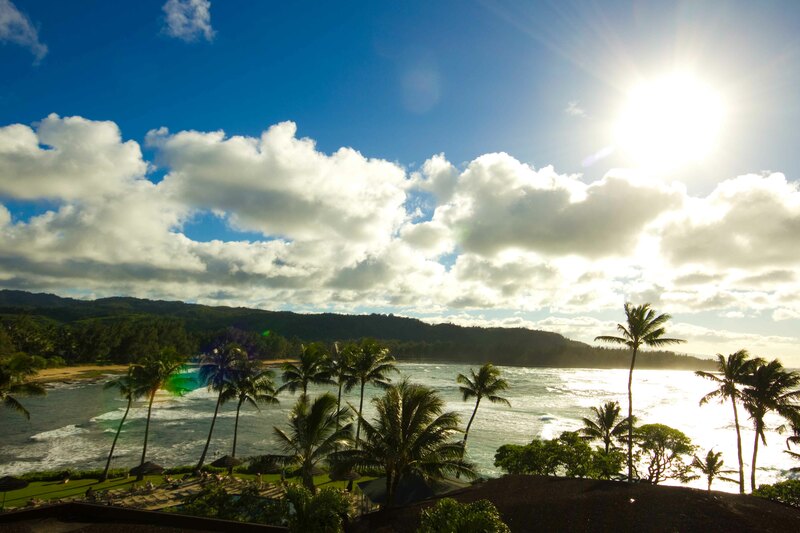 And when the offer included spending some time at the Turtle Bay Resort, I leapt at the chance to catch some rays at this most breath-taking place to stay. 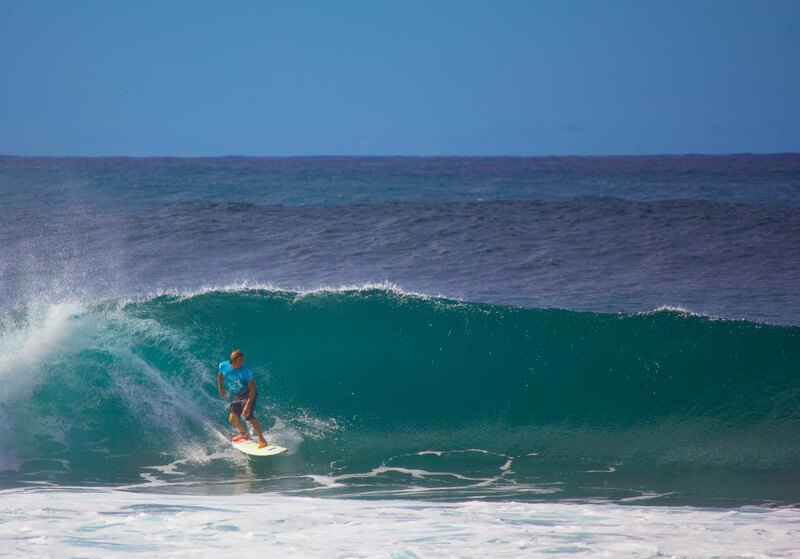 Surfer competing at the Volcom Pipe Pro. Now that I’ve set the scene, I’ll get to the food. 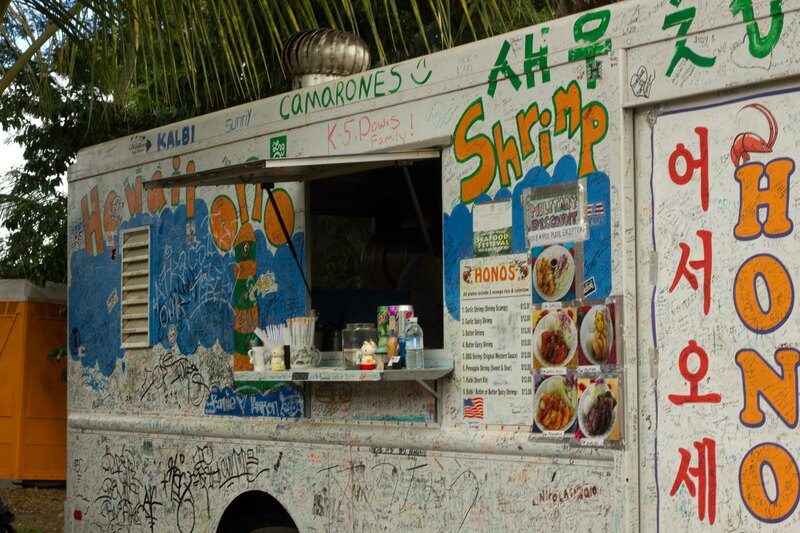 The shrimp trucks of the North Shore are well-known and it seems like everyone has their preferences. I’ve been to a few in the past, (Giovanni’s and Romy’s) but wanted to try others. I read the reviews and came up with a list. Lucky enough I was able to enlist in some help from some other hungry belly’s to increase my sample size. 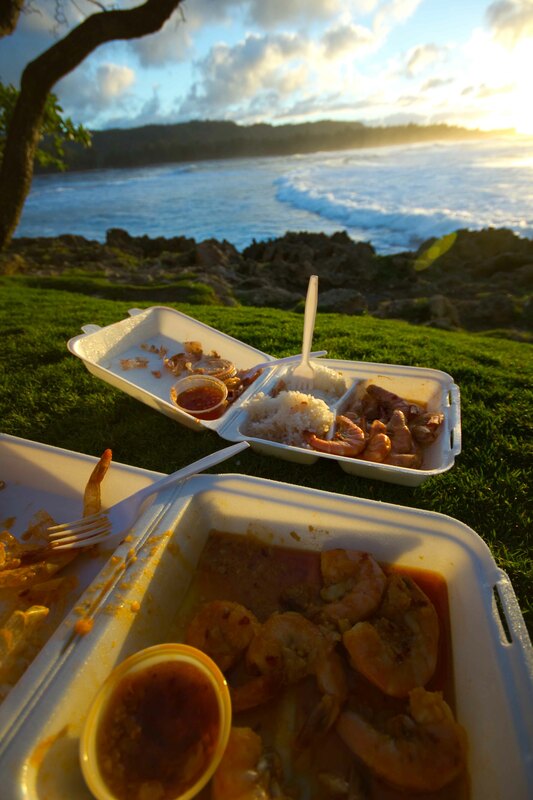 I ran out to grab some shrimp to eat to eat on the lawn for sunset. 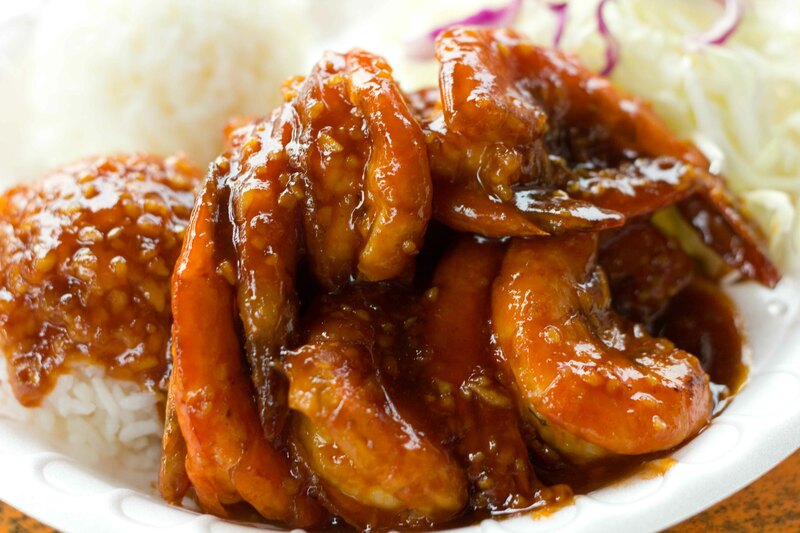 Fumi’s spicy garlic shrimp are in the forefront, Romy’s in the back. Behind that, one of the most beautiful sunsets I’ve ever seen. First stop was Fumi’s for an order of spicy garlic, ordered hot with extra hot sauce on the side. This was my favorite of all the shrimp dishes sampled because shrimp were plump and cooked perfectly. The sauce was addictive but with enough heat to make me stop just before I was about to pick up the extra sauce to drink it. I’d like to say the surroundings persuaded my opinion on ranking this number 1, but accompanying my favorite was also my least favorite, the sweet and spicy shrimp from Romy’s. The shrimp were smaller and over-cooked. The sweet spicy sauce was good but not close to the deliciousness of the one at Ono. I was most excited about going to Macky’s for their deep-fried coconut shrimp. From photos I’ve seen, it looks like a really good version of something you’d get at Red Lobster. What I never read about though was that it can sell out, which it had by the time I had gotten there. No worries though, I hopped back in the car and drove a few minutes away to the parking area where Giovanni’s is located. Try not to be turned off by the dinginess of your surroundings or the abundance of flies. The shrimp here is good. 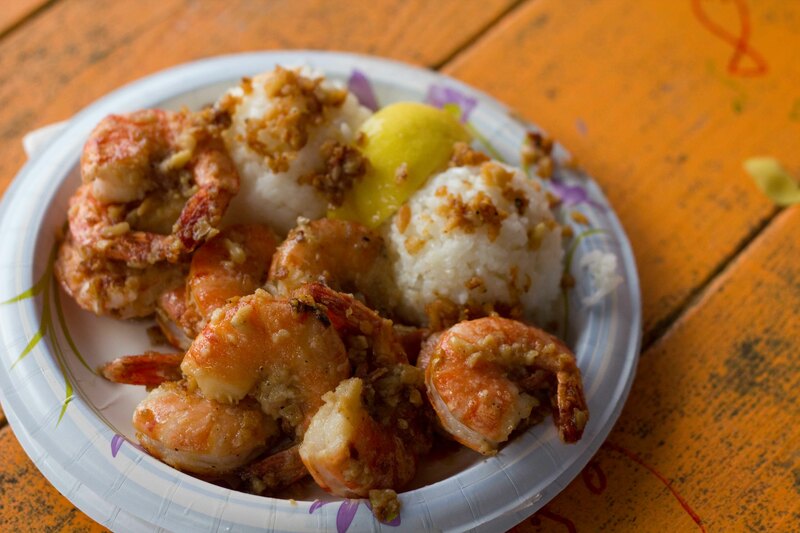 Garlic shrimp (aka Scampi) – Not saucy like rest, so the rice was unnecessary. The shrimp were big though and cooked really well. 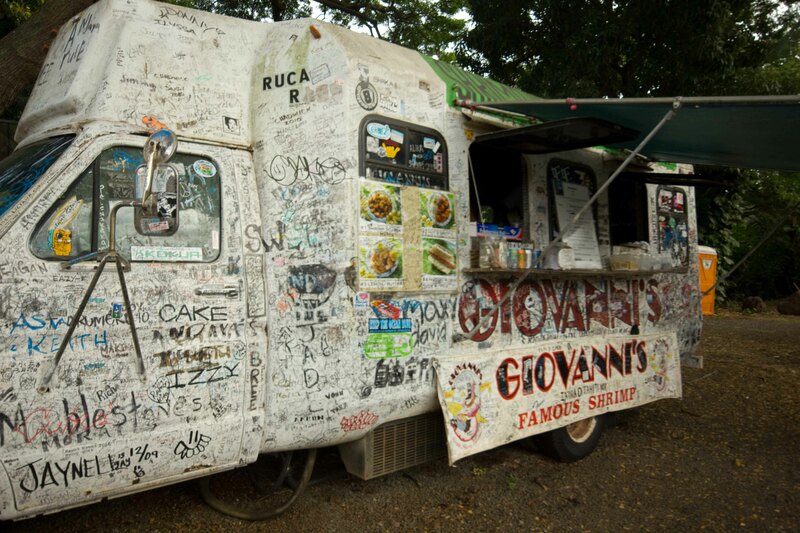 The Hawaiian Ono shrimp truck sits right next to Giovanni’s. The food takes longer to serve up, although you feel each dish here is made to order. Spicy garlic – the shrimp at Ono were the smallest we had, so these suffered a bit from being overcooked. The sauce started off sweet but had a creeper heat that became more and more delightful with each bite. 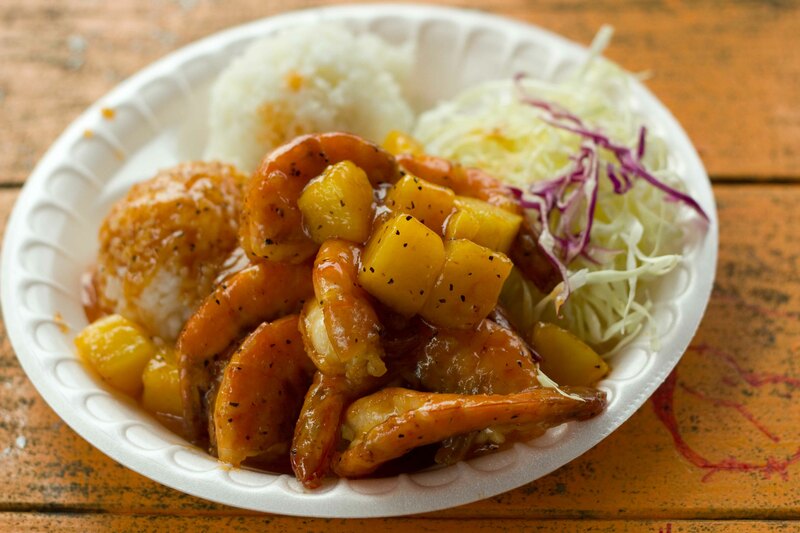 Pineapple shrimp – almost too sweet, but a nice contrast to the spicy garlic dish. The little pineapple chunks were the best part of the dish.